Dragon's Den-style 'boot camps' for Armed Forces veterans are among ideas being proposed by a think tank to boost innovation in defence procurement. 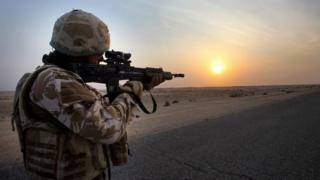 The Centre for Entrepreneurs said the expertise and experience of ex-service personnel was not being fully utilised. It said business schools should run programmes to help those serious about enterprise launch and grow companies. It also wants military bases to be used as laboratories to test prototype technology under supervision. The government has committed to strengthening relationships with suppliers and giving the UK's leading defence institutions greater entrepreneurial freedoms. A separate report commissioned by the Ministry of Defence, also being published on Monday, said the industry supported 500,000 jobs directly and indirectly in the UK, including more than 25,500 apprentices. The UK has Europe's largest defence budget but concerns are regularly raised about its affordability and value for money, as well as the degree to which contracts are dominated by a small group of multi-national firms. How do companies win government contracts? Defence Secretary Gavin Williamson has reportedly called for £20bn in extra spending over the next five years to counter growing threats. Equipment procurement currently accounts for about a quarter of the annual defence budget which, according to the National Audit Office, totalled £35.3bn in 2016-7. The spending watchdog warned last year of a potential black hole of up to £20bn in the Ministry of Defence's 10-year £179bn equipment and support budget. A new report suggests there is an opportunity to "revolutionise" innovation in the defence sector by capitalising on the skills and knowhow of the thousands of veterans who retire every year. The Centre for Entrepreneurs said the UK had to learn from the United States and Israel, among others, about how best to unleash the entrepreneurial potential of its service leavers. While there are many veterans working in business, including in the defence and security sector, the report said those able to develop high-tech ideas with the greatest growth potential were often not being identified. It said institutions such as London Business School, Warwick Business School, or Cranfield University were best placed to run the training camps because of their experience in executive leadership programmes. The report says all new innovative technology that emerges through such programmes should be tested in military environments, ideally overseen by veterans with commercial expertise. "All too often in defence, the end-users' experience and insight does not reach those innovating new products," said its author Matt Smith, director of the Centre for Entrepreneurs. "Worse still, innovations rarely get tested with service personnel before they are expected to use them in the field." The Ministry of Defence, the report added, should learn from GCHQ and the City of London about how to partner with specialist organisations to set up innovation hubs and business incubators. The Defence and Security Accelerator, which is based at Porton Down, Wiltshire, has a remit to support innovative research and take new projects, including from small firms and start-ups, to market. But the report suggested its model of procurement "stifles competition and limits the scope of innovative thinking" and it should be offering equity-free investment as well as office space and guidance. Mr Williamson said the defence sector was vital to the UK economy, providing specialist and highly-skilled employment in every part of the country. He said a report written by former defence minister Philip Dunne - which calculated the defence industry had annual sales of £22bn and exports of £7bn - showed its reach and importance after Brexit. Mr Dunne said the industry should seize the opportunities to "adapt and improve its own processes to help meet the challenges of the high-tech defence future".